The Bangor public school system opened its third annual summer session in July 1961 with 356 of the 365 registered on hand for the opening classes. 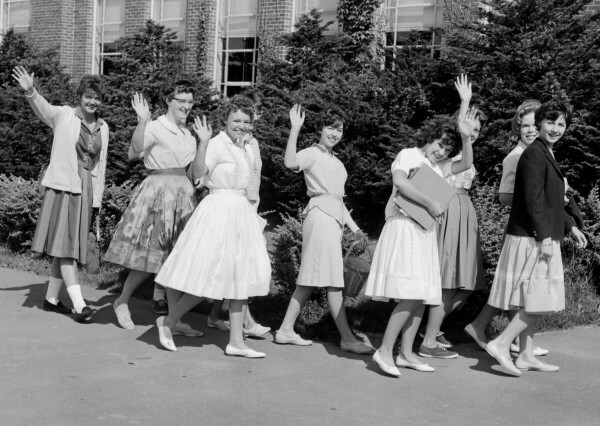 This group of girls looked anything but sad as they went to classes at the Garland Street Junior High School. Educators have a choice — allow teens to nod off or sleepwalk through the first hour of their school day or start high school at a much more civilized hour. For years, teachers, parents and teens themselves have made the case that adolescents have a biological clock that keeps them wide awake until midnight and able to sleep soundly to noon. A number of studies have confirmed that this awake-sleep cycle is not some form of youthful defiance but in fact physiological. So why do high schools often schedule homeroom for 7:35 a.m.? To make the bus in that schedule, high school students must rise at the ungodly hour — for them — of 6 a.m. or earlier. One of the reasons often cited for the early start is that afternoon daylight hours are needed to accommodate after-school athletics. Increasingly, though, soccer, field hockey and football are played under lights at Maine high schools when the sun begins to set earlier in early November. Another reason, probably a throwback to decades ago, is that early-start, early-release allowed teens to get an after-school job. But put those arguments against what many experts see as facts that come with the early start: poor student performance, tardiness, missed school days and behavior problems. One small, rural, regional high school in Eastham, Mass. began starting school at 8:35 a.m. in September. A report examining the efficacy of that change — more than an hour later than last year — shows remarkable results. According to the Cape Cod Times, data from the first two months of the school year at Nauset High School has been gathered and it is compelling. There was a 53 percent drop in the number of failing grades from the previous September and October, the school found, from 221 to 104. The number of Ds and Fs also dropped, from 597 to 368. In September and October 2010, when the earlier start time was in effect, there were 166 student suspension days at the high school. Last fall, that dropped to 19 days. The school had hoped to also reap transportation savings with the change, but that has not materialized. Since elementary-school-age children are typically wide awake earlier than teens, it makes sense to switch the schedules so lower grades start earlier. But tardiness jumped at the district’s elementary and middle schools for the first two months. Speculation by school officials is that parents, many of whom drive their children to school, were still adjusting to the time change. One expert on teens, Dr. Mary Carskadon, says they need 8.5-9.5 hours of sleep each night, and since most don’t get that, they live in a continuous state of jet lag, as she describes it. Starting high school later is a low-cost way to make a difference in educational outcomes.